When working on large, sophisticated projects, it is advisable to separate drawings into multiple pages and use page prefix to denote symbol references and wire names. Once enabled, Electra will insert and maintain all your page prefixes automatically. Engineering change is a fact of life, and page prefixes enables you to insert, delete or move your pages on the fly, rather than inserting spare pages or spending long, error prone, precious hours manually updating them. Benefits: Users get to produce better and safer electrical designs faster, eliminates labor intensive, error prone manual tasks. 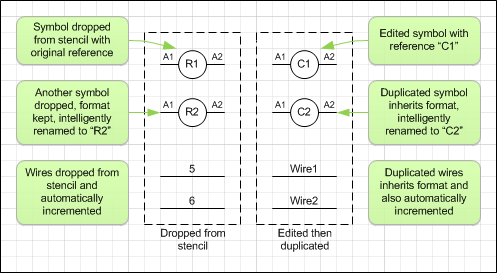 The most repeated task during electrical CAD drafting is the duplication of symbols and wires. When a symbol or wire is duplicated, Electra automatically and intelligently rename it to the next number (e.g. R1 to R2). If you change a reference to your own format (say, "CAD1"), and then duplicated this shape, Electra will inherit the format and intelligently renumber to "CAD2". Benefits: Intelligent duplication saves lots of typing time. Intelligent inheritance saves even more. It feels like you've just hired really good help, show how it's done once, and Electra picks it up from there, no predefined formats to remember. What is Intelligent Duplication and Inheritance? One of the most powerful tool in Electra is its Intelligent Copy and Paste. No special tools or utility, just copy and paste, and Electra will be able to automatically and correctly rename all your symbols and wires. Draw once and re-use your circuits for unparalleled productivity. Benefits: Simple fast cable management on electrical drawings. Easy to use cable core assignment for portable, sharable drawings without any loss of information. Better yet, save entire circuits into a stencil, then drag and drop them onto your electrical drawings. Build up your collection of circuits, or share them on a network with your colleagues, email them to fabricators or share them online. All in portable stencils with just drag and drop. Data or component information can also be stored on PreFab circuits, making them ultra portable for easy sharing. Benefits: Portable, sharable circuits at your finger tips. 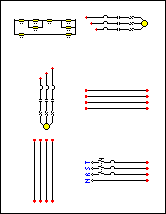 Fast and standardized electrical circuit designs made easy for companies and teams.